I would have bet a million dollars that we would not be having snow this Christmas...and I would have been very wrong. Addie and I were absolutely overjoyed when it started snowing today! Arsen, not so much. He hates cold weather. Basically, he's crazy. The fact that we had a white Christmas made my day about a zillion times better. 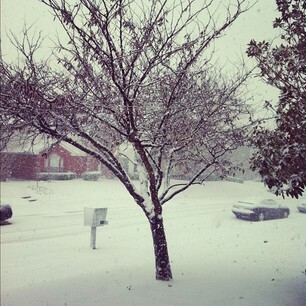 I would take snow all winter long if possible....but in Texas, I'm lucky if I see it even once a year. I've been in a very scrooge-like mood leading up to the holidays this year. I always have an idea of exactly how I want things to go, and when things get off track I tend to let that bum me out. Because of work, Arsen and I weren't able to be in Oklahoma with my mom's side of the family tonight, and since that's how I always spend Christmas it just kind of threw me off a bit. But things actually ended up being pretty great. After spending the past few days with family, this morning Arsen and I woke up with nothing to do and nowhere to be. And it was actually quite wonderful. We had breakfast, opened gifts, and spent the day lounging around by the fire watching movies. I took Addie out in the snow a few times which is always hilarious. She loves snow, which is kind of sad since we never get it. Every time she gets to play in it she sprints back and forth, hops around like a little rabbit, and has a huge smile on her face. Yes, I swear. She can smile. She played so hard that she wore herself out. She's been asleep for the past few hours, just passed out on the couch beside me. So even though my plans didn't go exactly how I would have designed them, everything worked out for the best. We got to be home as a little family, enjoying the snow and time with each other. This morning when we woke up we were talking about how this will be our last Christmas without a little one. I'm so excited for him to get here and to spoil him like crazy next year, but I think it made the day even more enjoyable, just knowing that this will be the last Christmas for me and Arsen to lounge around and be lazy, the last Christmas that Addie's an "only child", and the last holiday it will be just the three of us. It's been just me, Arsen and Addie for the past three years...poor little thing is in for quite a change! I hope everyone has a wonderful time spent with loved ones! Merry Christmas!!! Loving the snow pics! A white Christmas! Sounds like perfection! A simple, special last Christmas before baby. :) And I'm so glad you got to enjoy a white Christmas, too!